Fire places and fire pits are a great addition to any outdoor entertainment space. They can provide warmth and extend the life of a party as well as extend the use of your patio into the fall and winter seasons. 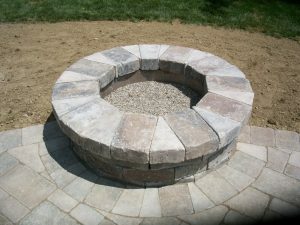 Dean’s Landscaping has years of experience creating outdoor fire features that will not only enhance your existing landscape, but compliment it as well. Nothing says quality time quite like relaxing around a fire with your family or getting a little solitude with your favorite book. Fire features can come in many different shapes and sizes and be created to operate with propane or natural gas burners, as well as traditional wood burning. Natural stone or manufactured wall blocks are some of the choices for fire features and can be tailored to fit your budget and aesthetic style of your property. Let’s get started on your fire feature project.